It's the best Friday of the month - the one when popular Silhouette Store graphic designer Lori Whitlock shares a free Silhouette Studio cut file with Silhouette School readers! 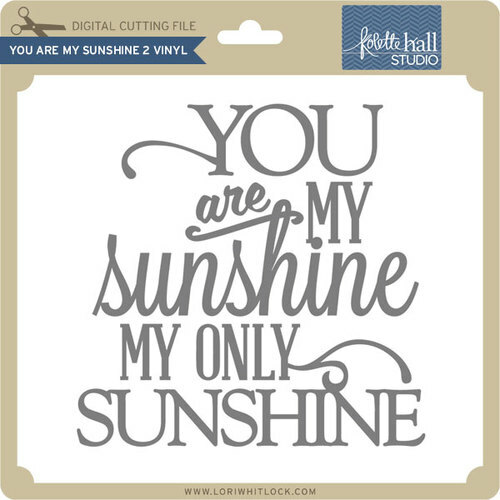 This month Lori is sharing this adorable and free You Are My Sunshine design file! I think it would be perfect on pretty much anything you can create with Silhouette CAMEO! You could cut it on paper and create an adorable scrapbook layout or DIY paper card. You could cut on heat transfer vinyl for a canvas bag or put it on a throw pillow. You could cut on adhesive vinyl and make a large wall decal! It's one of those awesome cut files that would pretty much be perfect no matter how you use it! So head on over to Lori Whitlock's website to download this one! A few things to remember, this file can only be used for personal use and it will only be free for a few days - so don't delay or you'll have a big rain cloud over your otherwise sunshiny day! After you download the file, open it in Silhouette Studio to create a design and cut with your Silhouette CAMEO or Portrait! Addicted to this song and the freebie too. Thanks so much for sharing!